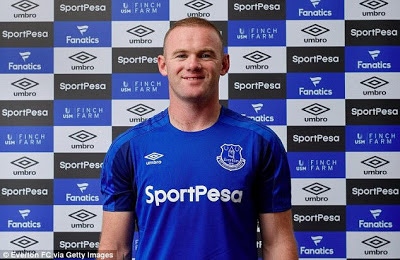 Wayne Rooney signs for Everton – Royal Times of Nigeria. Manchester United has announced that Wayne Rooney, the club’s all time highest goal scorer with 253 goals has just signed for his boyhood club, Everton which he left 13 years ago on a free transfer. Rooney joined Everton after Man United offered to buy out his remaining contract, in a deal that involved the £75m capture of Romelu Lukaku. Everton confirmed the two-year deal with a short teaser video entitled ‘welcome home Wayne’. Announcing on the club’s website, Jose Mourinho said: “It is no secret that I have long been an admirer of Wayne; he has been a model professional throughout his time at the club and will remain in the history books for many years to come. Man U’s Chief Executive, Ed Woodward said: “Wayne has been a fantastic servant to United since the moment he signed for us as a prodigiously talented, explosive teenager some 13 seasons ago. “Who can forget his storybook debut hat trick against Fenerbahce, the spectacular overhead kick against City and the countless match-winning performances in his time here? But after much discussion, the club has decided to accept his request to rejoin his boyhood team. “He goes having created some of the most magical moments in some of the most successful years in the club’s history. Wayne leaves us as our greatest ever goalscorer and having won every major trophy in the game. His record will take decades for anyone to get close to matching and I am extremely grateful for the way he has led from the front since being appointed club captain three years ago.